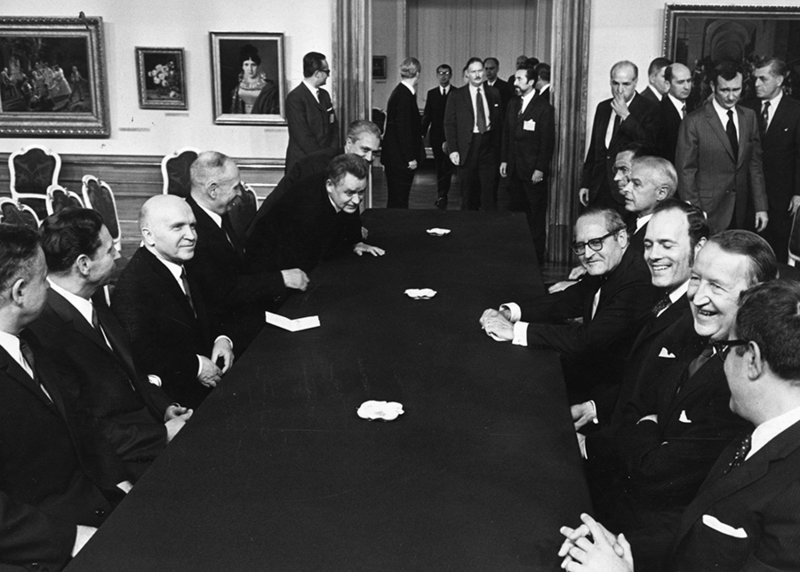 View of the Soviet delegation (left) and United States negotiating team (right) sitting together during Strategic Arms Limitation Talks (SALT) in Vienna, Austria circa 1970. Negotiations would last from 1969 until May 1972 at a series of meetings in both Helsinki and Vienna and result in the signing of the SALT I agreement between the United States and Soviet Union in May 1972. (Photo by Keystone/Getty Images)The size of U.S. and Russian nuclear stockpiles has decreased significantly from their Cold War peaks, but the dangers posed by the still excessive arsenals and launch-under-attack postures are even now exceedingly high. Such arguments ignore the history of how progress on disarmament has been and can be achieved. For example, the 1969–1972 SALT negotiations went forward despite an extremely difficult geostrategic environment. As U.S. and Russian negotiators met in Helsinki, President Richard Nixon launched a secret nuclear alert to try to coerce Moscow’s allies in Hanoi to accept U.S. terms on ending the Vietnam War, and he expanded U.S. bombing into Cambodia and Laos. Meanwhile, the Soviet Union sent 20,000 troops to Egypt to back up Cairo’s military campaign to retake the Sinai Peninsula from Israel. In late 1971, Nixon risked war with the Soviet Union and India to help put an end to India’s 1971 invasion of East Pakistan.